Last week, Cliff was inspired by the Matthew Williamson range of fabrics and wallpapers. You may remember the dragonfly wallpaper that we posted. Today, we are going to show you more from Matthew’s range. We are also proud to announce that Beadles is an exclusive stockist of Seneca Textiles, and therefore this collection in Toowoomba. Matthew Williamson is an internationally renowned British fashion designer, who has had his own fashion design house for over 17 years. For more about his fashion label, please see his website http://www.matthewwilliamson.com/. 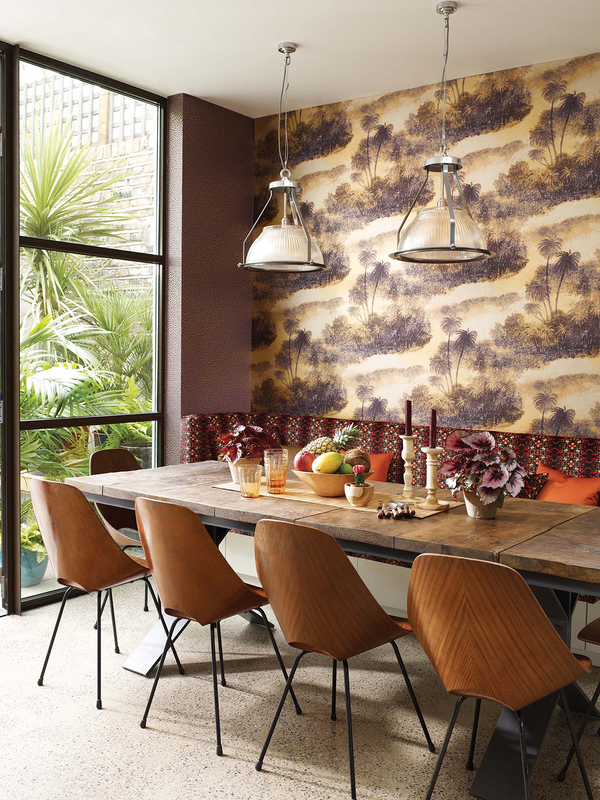 Matthew Williamson first paired with Osborne and Little in 2013 for wallpapers and fabrics. This new collection (including both fabrics and wallpapers again) for 2014 titled Samana, has only recently been released in Australia. This range includes a few differing design styles. The most striking style included is a jungle/tropical theme and encompasses designs ranging from a tropical island come mirage scenes in low tonal contrasts; exquisite dragonflies in the most beautiful sheer linen; a large scale busy printed pattern with various jungle birds, butterflies and a variety of plant species; a dizzy mosaic/kaleidoscope velvet that takes you back to childhood and even a simplified version of a leopard spot/snake skin design, depending on your interpretation. Then there are more classic designs, but with a twist – a stripe/chevron/dot all in one (yes that’s right, all in one), which comes together so simply; a marbled effect paisley design; a large scale damask design in a stripe formation highlighted with glitter. How do you use this in your home? These patterns certainly aren’t for the faint of heart! Find the feature wall in your home for the more stunning wallpapers, or use the more classic papers for the area in your home which could use a lift that no one expects (like in the image next to the stairs). Always look for the common elements or threads. For example, the tropical island/mirage wallpaper was used to bring the outdoors in and then you will notice that the table, chairs etc are timber and the table decorations are also timber and tropical fruit. The lights while glass and metal are a bit more industrial to add to the raw feel. Altogether creating tropical but with sophistication! If you are unsure how this could work for you, or you would like to see and touch more of these designs, call Beadles for an appointment.